At many regional rail stations, customers face the difficult challenge of having to traverse an area. Nothing is more annoying on an escalator than when you’re wishing to walk and someone in front is blocking you from doing so. Adding additional stickers would not be costly to implement yet they would largely have the same level of benefit to the end users. 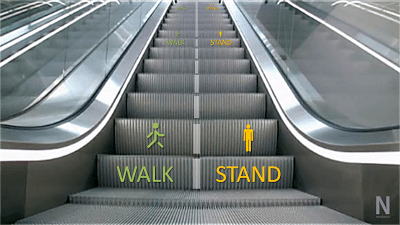 Meet with Communications to have labels designed for escalators. Begin pilot program on various high-traffic elevators that can also be viewed from security cameras. Review footage before and after to determine if there is a decrease in escalator crowding and passenger blockages. If successful, expand to escalators throughout the system.